Things to watch out for when using logical replication. PostgreSQL 10 came with the welcome addition of the logical replication feature. This provides a more flexible and easier means to replicate your tables than the regular streaming replication mechanism. However, it does have some limitations that may or may not prevent you from employing it for replication. Read on to learn more. What Is Logical Replication Anyway? Prior to v10, the only way to replicate data residing in a server was to replicate the changes at WAL-level. During it’s operation, a PostgreSQL server (the primary) generates a sequence of WAL files. The basic idea is to get these files over to another PostgreSQL server (the standby) which takes in these files and “replays” them to recreate the same changes happening at the primary server. The standby server stays in a read-only mode called the recovery mode, and any changes to the standby server are not permitted (that is, only read-only transactions are allowed). The process of shipping the WAL files from the primary to standby is called log shipping, and can be done manually (scripts to rsync changes from primary’s $PGDATA/pg_wal directory to secondary’s) or through streaming replication. 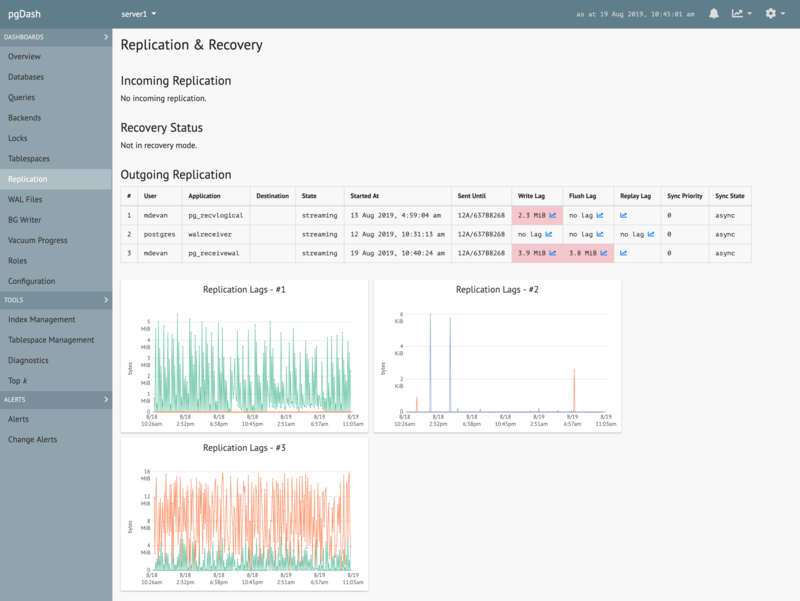 Various features like replication slots, standby feedback and failover were added over time to improve the reliability and usefulness of streaming replication. One big “feature” of streaming replication is that it’s all or nothing. All changes to all objects from all databases on the primary have to be shipped to the standby, and the standby has to import every change. It is not possible to selectively replicate a part of your database. The destination table has an extra column “col3”, which is not touched by the replication. The changes are replicated “logically” – so, as long as it possible to insert a row with t.col1 and t.col2 alone, the replication process will do so. Compared to streaming replication, the logical replication feature is perfect for replicating, say, a single schema or a set of tables in a specific database to another server. Assume you have a Django application with it’s set of tables living in the source database. It’s easy and efficient to setup logical replication to bring over all these tables into another server, where you can run reporting, analytics, batch jobs, developer/customer support apps and the like without touching the “real” data and without affecting the production app. This means that if your Django application has added a new feature that needs new columns or tables, and you’ve to run django-admin migrate on the source database, the replication setup breaks. ERROR:  duplicate key value violates unique constraint "s_pkey"
Oops, what just happened? The destination tried to start the sequence from scratch and generated a value of 1 for a. This is because logical replication does not replicate the values for sequences since the next value of the sequence is not stored in the table itself. use non-overlapping ranges – for example, the first server generates and inserts numbers in the range 1 to 1 million, the second one in the range 1 million to 2 million, and so on. This happens because the destination won’t be able to uniquely identify the row that needs to be deleted (or updated) without a primary key. If your table really has no way to uniquely identify rows, then you’re a bit stuck. See the REPLICA IDENTITY section of ALTER TABLE for more information. Wouldn’t it be nice to have a source that is partitioned one way and a destination in a different way? For example, at the source we can keep parititions for each month, and at the destination for each year. Presumably the destination is a bigger machine, and we need to keep historical data, but need that data rarely. Postgres complains that it needs the partition table for Jan 2019, which we have no intention of creating on the destination. This happens because logical replication works not at the base table level, but at the child table level. There is no real workaround for this – if you’re using partitions, the partition hierarchy must be the same on both sides of a logical replication setup. Large objects cannot be replicated using logical replication. This is probably not a big deal nowadays, as storing large objects is not a common modern-day practice. It is also easier to store a reference to a large object on some external, redudant storage (like NFS, S3 etc.) and replicate that reference rather than storing and replicating the object itself.